There's no time like the dead of winter to start thinking about Spring. Since temperatures hit -16°C last night, it seemed like any excuse to think of warmer weather was not only warranted, but a necessity. Actually I had been mulling a particular idea over in my mind for some time. This year I think I'll establish the bones of a small herb knot garden. 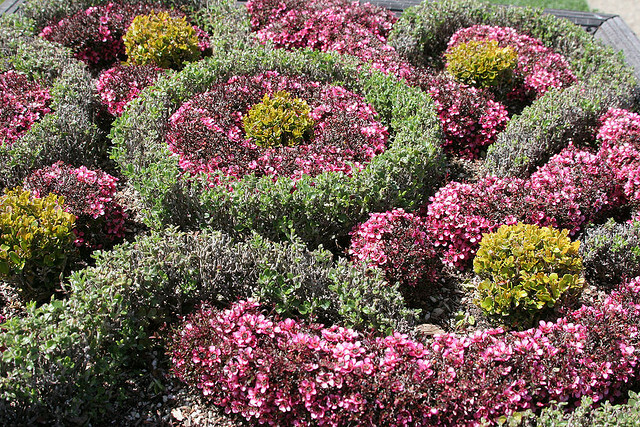 Different plants can create a stunning knot garden. 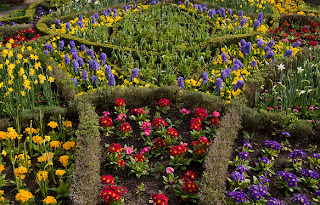 There have been gardens arranged in geometric patterns throughout history and in most cultures. 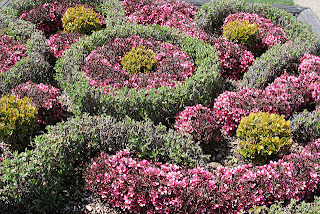 Knot gardens, as we know them, gained widespread popularity in Tudor England, when many of the designs were based on contemporary embroidery. Often constructed entirely of aromatics, they were meant to act not only as a medicinal and culinary resource, but also as a relaxing oasis from the smells of everyday life, which at that time could be quite pungent. Originally, common plants would have included germander, marjoram, thyme, hyssop, camomile, sage and the like. Over time fashions changed, and most now have their defining shapes made of shaped boxwood. 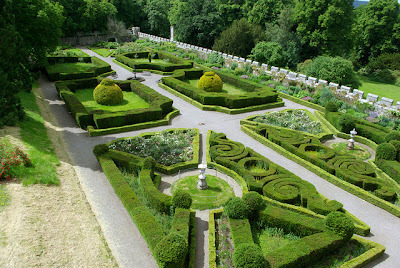 So technically they are more parterres than actual knot gardens. I know they're complicated to plan, grow, and maintain, but that's OK by me. My madness will hopefully solve two other problems. The first is winter interest, as the plants most usually used for the main shapes are woody evergreen perennials. Secondly, within the "holes"—those sweet little microclimates—I can experiment with some of the more borderline zone plants (like hardy rosemary). I may just pull some of them off. 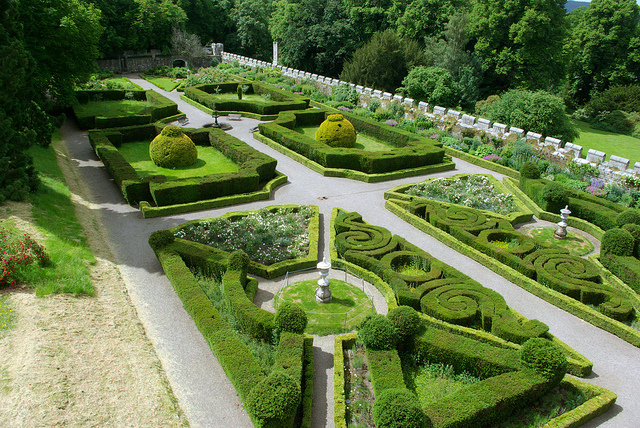 A knot garden generates micro-climates in the spaces between its "bones." Perfect for flowers or herbs that need more warmth and protection. Most likely a design that is not too complex or difficult (or expensive) to maintain would be ideal. 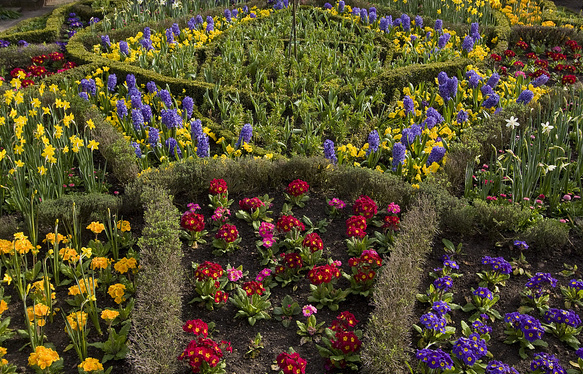 At the same time, it will need to be hardy enough to create those microclimate spaces that I am so coveting. Perhaps a semi formal arrangement like the image at right. I even like how the surrounding plants (I'm assuming lavender) break the formality somewhat. There's a flat area in the side yard that's just aching for something interesting. I think I'll fill it. If you like this link retweet it using the link at top right, or share using any of the links below. Design and Opinion: Ever have one of these days? Gardening: Weirdest tree in Nova Scotia? Opinion: A step too far?